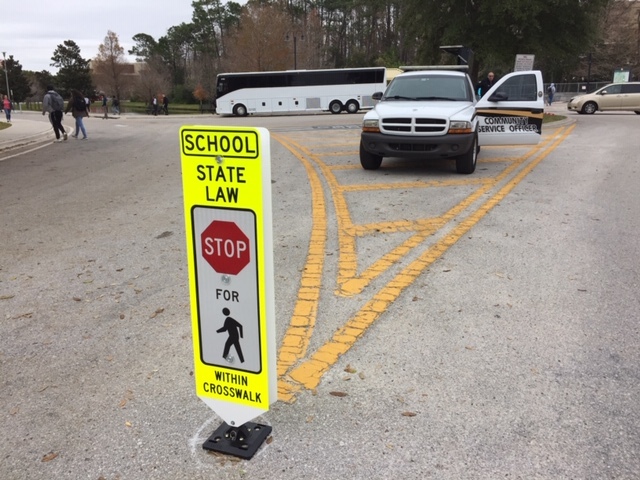 Newly placed crosswalk signs around campus are part of a three step approach by UCF Police to improve pedestrian safety on campus. “We’re using the triple e approach and it starts with equipment enhancement on campus, education and enforcement,” UCFPD Chief Carl Metzger said. UCFPD launched this initiative in response to requests by students, faculty and staff to improve pedestrian safety on campus, Metzger said. Within the first weeks of class two students were struck by vehicles and injured near the UCF campus. On Jan. 17 Mariana Bornacelli was hit by vehicle and taken to Orlando Regional Medical Center in critical condition, and Lindsey Rebekah Walker suffered minor injuries after being struck by a vehicle on Jan. 20. The signage warning drivers to yield to pedestrians was the first step in the enhancement process, Metzger said. On Wednesday five flashers were being installed on campus in “higher traffic” crosswalks that don’t have walk signals, Metzger said. Pedestrians will be able to press a button on the flasher that will alert drivers to wait for them to pass. UCFPD sent out a video to inform and educate the campus body about pedestrian safety. More videos and messages will be sent out to help educate pedestrians and drivers of the laws and their responsibilities, Metzger said. On Friday UCFPD will be out enforcing pedestrian safety laws, handing out educational materials to inform drivers and pedestrians and warn violators, Metzger said. “After a month, if our drivers haven’t gotten the message they’ll be written a ticket and it will cost them something over a $100 if they disobey pedestrian safety laws and violate the right of way of our pedestrians,” Metzger said. A member of UCF’s staff said he’s hopeful that these measures will help improve the safety of pedestrians, especially since he was nearly struck twice by cars while walking near the Student Union. Hitchcock complained that pedestrians “hardly ever” use the crosswalks near the Student Union. This technique that UCFPD is using has been effective in Central Florida at reducing violations by drivers, Metzger said.